During colder months, seniors can face unique challenges relating to the weather and may need extra help preparing for common winter dangers. Here are some safety tips that you can follow to make sure your loved one has a safe and happy winter. Although anyone can slip on icy roads or sidewalks, seniors can be more prone to major injuries due to a fall, including fractures, head injury, or lacerations. They also aren’t able to recover as quickly from injuries, making fall prevention very important. Shoes with non-skid soles and good traction are key, and making sure that cane tips aren’t worn out can also help prevent a slip. Once seniors come inside, they should remove shoes right away, as melted snow can also lead to slippery conditions inside the home. 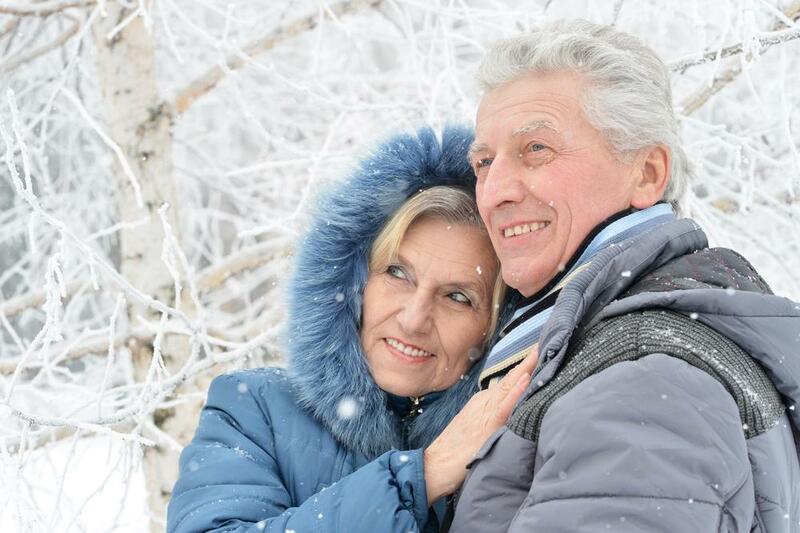 Seniors can be at risk of hypothermia in the winter if their body temperature drops too low – any thing below 95 degrees is considered extremely dangerous and requires immediate medical attention. Make sure thermostats are set to appropriate temperatures and encourage seniors to dress in layers. If they are going outdoors, they should wear warm clothing, including a heavy coat, scarf, gloves and thick socks and insulated shoes. Because of the dangers present with moving around during snowy months, many seniors choose to stay home. Though this can help prevent accidents due to weather conditions, it can also cause feelings of isolation and loneliness. If you know your senior may not be getting as much personal interaction as normal, make sure you’re reaching out to offer companionship. If the weather is really treacherous, or if you live a long distance from your loved one, even a short daily phone call can help alleviate loneliness and make a long winter that much happier. With the dangers of snow and ice present in much of the country, it’s important to make sure that the car is in tip-top condition to prevent accidents. Before winter hits, you should get your vehicle serviced, ensuring that tires are in good shape, that windshield wipers are working correctly, and that the battery is ready for the cold weather. In case of emergency, an AAA membership isn’t a bad idea either. Winter storms can cause power outages, so prepare your loved one in case power is lost. Flashlights, warm blankets, and a battery-powered radio are must-have items. In the case of a longer power outage, it’s important to make sure that a supply of non-perishable food items is on hand as well. In areas that are very prone to power outages, a generator may be a good idea. In colder weather, people may eat a smaller variety of foods, since not as much is available at the supermarket. This can lead to vitamin deficiencies if you’re not careful, so be aware that this could be a risk. Vitamin D deficiencies are especially common, at least partially due to a lack of sunlight, and consuming foods that are fortified with vitamin D can be a good way to stay healthy during winter months.